56 Charm Squares or 5" x 5" squares. We are using Emily Herrick's Hall of Fame line. Start by selecting (3) 5" squares and cutting them in half as shown. Lay out a row of charm squares 7 charms long and then place one of your half charms at the beginning and end of the row. Sew the row together. Just place the first half charm onto the first charm in the row and sew a 1/4" seam. Continue repeating the process adding one charm at a time and sewing a 1/4" seam. No need to pin, just align as you go. When you are finished with the row press all the seams to one side. Repeat the process to make a total of 3 rows. To make the alternate rows, simply lay out 8 charm squares in a row. Sew the row together using a 1/4" seam. If you are not worried about the order of the row, just sew groups of 2 charms together and then turn them into 4, and then 8. If you want a certain layout, sew the row together the same way you did the previous row adding one square at a time. Repeat to make a total of 4 rows. You now will have 7 rows. Lay them out as follows alternating the 2 different rows. Move the rows around until you have a layout hat is pleasing to the eye. Sew the rows together. I like to do this by sewing Row 1 and 2, Row 3 and 4, and Row 5 and 6. Sew a 1/4" seam along all the groupings. Press. Then sew Row 1/2 to Row 3/4 and Row 5/6 to Row 7. Lastly sew the 2 halves together. Note - When you go to sew the rows together, they will not line up perfectly because of the half blocks. Simply overlap the solid rows by 1/4" on each edge and then pin the row in place to sew. This will be trimmed to even it up. Now your rows are all sewn and be sure to press all the seams nice and flat before trimming. Using your ruler, trim the sides of the quilt so they are even. You should be trimming about a 1/4" from every other row, but if you had a few that weren't quite even, you can trim those even as well. Now with your square top, you are ready to add the applique row. 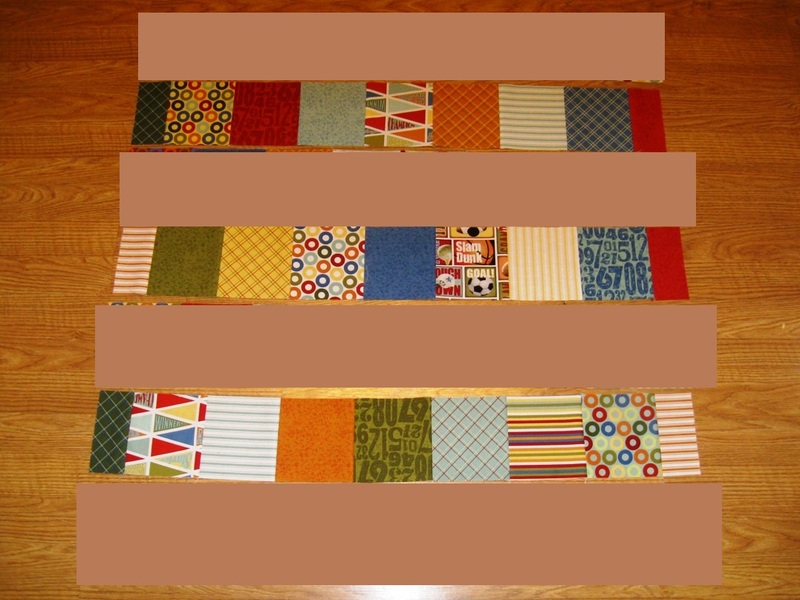 From your applique strip yardage, cut a 6" x WOF strip. Align the strip along the bottom of your quilt top and trim it to the width of your quilt top. Add your desired applique to the quilt top. To see a detailed post on how to do this applique you can see yesterday's post on Applique with the Slice. Oh, and while you are there, you can sign up for the Slice Machine Giveaway, bonus!! Lay your applique strip along the bottom of your quilt with right sides together. Pin and sew a 1/4" along the pinned edge. Press towards the applique strip. Just a little quilting detail. I started with a star in the center of the quilt and then continued out using my walking foot. How fun!! Keaton is a lucky boy! Oh that is such a lovely baby boy quilt! I love your quilting too! Love how that came out. I wanted to add a name for my grandson, maybe the next one. Cute Boy Quilt! It's been a Girl year in my family but there are a few boys that have been born, that I could make this for, too. Love it! What a great quilt for a little boy! Thanks for the cute tute! Love the baby quilt! A Pin for sure! What an adorably cute idea!! Thank you! Great idea! Love the lay out and the fabircs you selected for this adorable quilt. fa la la! love them all. Oh Wow! I love this quilt with your end zone appliqueing too Melissa! The idea of quilting with a star in the center and echoing it with your walking foot is awesome too! I love this baby boy quilt. Just the idea that I trying to find!! Thank you.